National Institute of Hydrology is recruiting for the post of Resource Person (Junior). Eligible candidate can attend the walk in Interview on 11th June 2015. 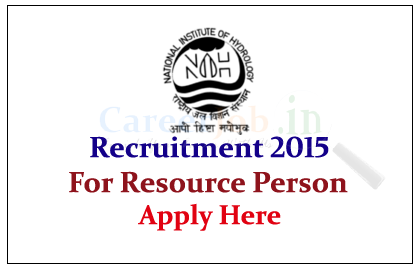 National Institute of Hydrology (NIH) is a Government of India society under Ministry of Water Resources and has been functioning as a research Institute in the area of hydrology and water resources in the country since December 1978 in Roorkee City. Interested and eligible candidate can attend the Walk In Interview with updated CV to Below mention below address on 11.06.2015, for more details kindly check official notification.